Prime the lids as usual and lend it a wash of berry into the crease, this will be your transition shade making the lending process easier later on. Stick on some tape on your outer corner, connecting with your lower lash line (make sure you don’t stick on your lashes). Trace a line with black kohl and flick it straight from the V as in the picture. Blend the kohl inwards feathering gout the colour. Pick up a dark purple shade and apply it onto the areas you have applied the kohl, the kohl underneath will give this purple more depth. 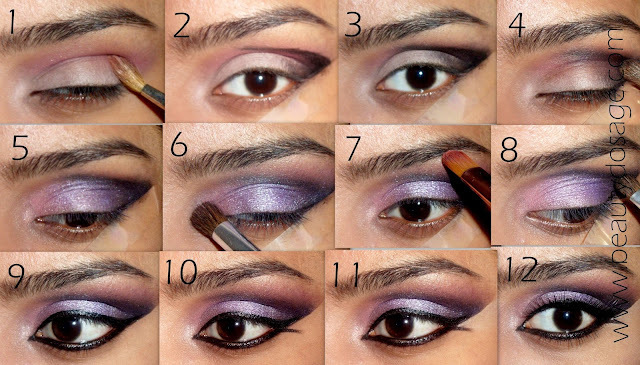 Apply a shade lighter purple right after the darkest purple and an even more light one close to the inner corner. At the inner corner, apply a light lilac shade. This will be your tear duct highlight. This step is all about blending, blend the most at the outer corners where the darker shades where places and feather inwards. Also lend in between the shades of purples. Trace in some concealer on the edges of the lines to make them appear sharp. Load up the mascara especially in the lower lash line and place your fake lashes. I’m using lashes that are longer at the ends. This look took me the longest of all looks concerning all the little details, i would suggest you spend most of your time in drawing precise lines especially the flick at the ends it really does pull the look together. Hope you try this look! Have you entered my NYX nail polish set giveaway yet? Enter HERE. really interesting and perfect for everyday also!I wait for you darling! Kisses from a very cute Rome! I have to learn from you how to create that perfect sharp wing. Do you use cellotape or its by hand only? Love it. It is such a nice look. i love this dramatic look. i like how the outer V is really precise. Thank you for the tutorial. Maybe you can do an everyday smokey look for daytime too. Good job! Came out great ! magnificent look! love the idea of using tape to get a straight line. thanks for ur lovely comment, i agree about following each other! hope u folow back. Awesome!! I am short of words...its just gorgeous ! Wow amazing job,love the big Arabic eyes,so pretty! thanks for your sweet comment. If you like follow on GFC and Bloglovin and like my Facebook Page too and leave a comment and I'll surely follow back!